These units are iron cored detuned filter reactors to be used at medium voltage power factor correction applications up to 34.5kV. Air core reactors have similar electrical characteristics as iron core reactors, but they lack an iron core. These reactors make up for the lack of magnetic material by having more turns in windings, thus resulting in larger dimensions. Since it is very hard to actually saturate air, these type reactors have excellent linearity, maintaining same amount of inductance value, regardless of current. 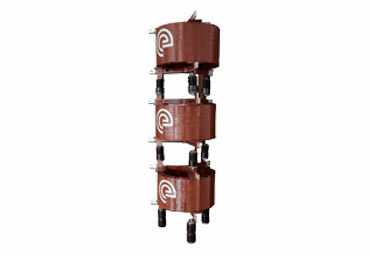 Air core reactors can be used independently, or they can be mounted on top of each other.